Energy bills are often thought of as a necessary expense for your home or business, with utility bill reductions only possible through pricey renovations. However, this belief is unfounded – with a few simple energy saving tips, you can reduce your utility bills through purely behavioral adjustments, quick purchases, or simple repairs. The notion of energy conservation lies at the heart of behavioral adjustments. Essentially, this means that any activities that consume energy through the use of household appliances should only be done when absolutely necessary. For example, you could hang dry your clothes instead of using a clothes dryer, the most energy intensive appliance commonly found in households. Another energy efficiency tip is to save by minimizing energy waste. Energy waste is often the result of carelessness, such as forgetting to turn off the lights or leaving the heater on while away from home. A common source of waste in today’s homes is leaving electronics on standby mode instead of turning them completely off. This particularly applies to older stereo equipment, which if left plugged in and in standby mode can add an additional $67 a year to your electricity bills. This is less of a concern for televisions, because TV designs have become more energy efficient in recent years. However, they are still an area with potential to minimize waste. The biggest wasters of energy in your home are heating and cooling appliances that are left on when nobody is home. These unnecessary expenses can add up to a couple hundred dollars a year, depending on the intensity and duration of the summer and winter seasons in your region. Temperature regulation constitutes nearly half of your utility bills and should be the main focus of your behavioral changes, rather than minor sources of waste. Some behaviors have the reputation of being energy wasters when in reality, they are not significant on the scale of an individual household. These include falling asleep with the television on, frequent vacuuming, and briefly leaving the refrigerator door open while deciding what to eat. However, unnecessary waste can add up over time and have a negative impact on your wallet, not to mention the environment. Rather than focusing on minor behavioral fixes that result in annual savings of under a dollar, it would be more cost effective in the long run to replace household appliances and electronics with more efficient options. As temperature regulation is the most energy intensive household activity, it has the most potential for significant savings. You do not necessarily have to replace your heating or cooling systems to decrease your utility expenditures. Simply adjusting the times at which they are being used can make a significant difference. This can be done through a programmable thermostat that automatically adjusts heating and cooling during the times when you are asleep or away. Without sacrificing comfort, you can save $180 a year on average through installing a programmable thermostat and maintaining its settings. Programmable thermostats also come in different models that can accommodate different weekly schedules. 7-day models are the most flexible: they allow you to set different programs for each day of the week. 5+2 and 5-1-1 models maintain the same program during weekdays, with program adjustments on weekends. Programmable thermostats can also come with additional features that are important in minimizing the energy waste from temperature regulation, such as indicators for when to replace air filters or when your HVAC system is malfunctioning. Air filters should be replaced every 3 months at minimum, as a dirty filter impedes airflow, which necessitates more energy to regulate interior temperatures. “Phantom loads,” or energy consumption by electronics that are plugged in but turned off, are a significant problem for the average household. 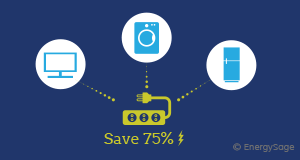 In fact, 75% of the energy used to power household electronics and appliances is consumed when they are switched off. This amounts to $200 a year in electricity costs for the average household. Unplugging each electronic device after use is an unrealistic expectation – it simply isn’t convenient for devices that are used multiple times a day. Advanced power strips offer a solution to this problem by automatically eliminating the phantom loads of all devices that are plugged into it based on certain factors. This differs from conventional power strips, which must be manually turned off and on. Advanced power strips can be set to turn off at an assigned time, during a period of inactivity, through remote switches, or based on the status of one “master” device. Furthermore, these power strips can accommodate devices that must be on constantly with special outlets. Although energy efficient lighting options are more expensive than conventional bulbs, this initial premium is more than offset by the energy savings they produce. Halogen incandescent bulbs, compact fluorescent light bulbs (CFLs), and light-emitting diode (LED) bulbs use 25% to 80% less electricity, and last anywhere from three to 25 times longer than traditional incandescent bulbs. For a more thorough discussion on the energy savings available from lighting upgrades, please see our article on the cost effectiveness of energy efficiency. Combine solar PV with energy efficiency, and your electricity bills could disappear. While reducing your energy use is one of the best ways to shrink your utility bills, producing your own electricity can cut your costs even further. Solar panels generate electricity for 25+ years, and the average solar homeowner can pay off their solar investment in just 7-8 years. 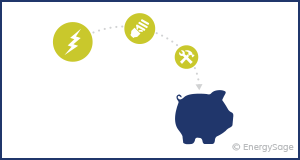 Use EnergySage's Solar Calculator to get a customized estimate of your solar savings.